How do I use the VelocityMap effect? 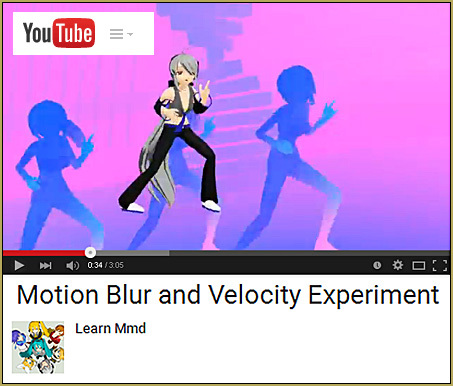 Where do I download the Velocitymap effect for MikuMikuDance? I came across the MotionBlur/VelocityMap effect while I was surfing YouTube. More often than not, those “suggested” videos are rather lame. This time a suggestion was a winner. The VelocityMap effect is one of those really flexible effects, you can use as a background or primary effect. We get a lot of questions regarding why a particular effect won’t work and more often than not, it is because they haven’t properly installed MMEffects (or there are some backward compatibility issues with some effects). Please see Noko2’s article about that. You can download the effect from the DbStudios site http://sta.sh/026sjh3pmk1k. There is no password. Make sure you place the VelocityMap effect into your Effects folder. You will notice that this download contains two effects: the VelocityMap and MotionBlur. I will concentrate on the VelocityMap in this article. This should be rote by now, however, make sure you load up all of your models, motion data, stages, and skydomes then add your effects last (because they are such a drain on the CPU). When the VelocityMap effect is added to the program, everything on the Display Panel will turn to a light blue. Because this effect masks so much detail, I think the best way to show off this effect is with some close and dynamic camera motion data and a stage with a lot of angles. If you were to use a slow, wide pan shot, on a somewhat barren stage, then all you would see is a light blue screen. I should mention, in passing, that the MotionBlur does exactly what it states. It creates the appearance of blurred motion. This is a rather realistic effect. Whenever we witness someone running or jumping what we see is a flurry of action and then some moments of stillness or reduced motion. I think Haku looks rather comfortable with the three dancers behind her. Side Note: I’ve noticed that this effect doesn’t seem to play well with other effects. The final render could end up pixelated. It might be a problem with my video card I hope you will try this out with better success.